Paul Cheney is an historian of Europe with a specialization in old regime France and its colonial empire. Before beginning his PhD training in history at Columbia University, he studied political economy at the New School for Social Research. He has taught at Columbia University, the European College of Liberal Arts (Berlin), and the Queen's University of Belfast. The unifying element of Professor Cheney’s work is an interest in early modern capitalism, and in particular the problem of how modern social and political forms gestated within traditional society. Old regime France serves as an excellent case study in this problem because of the way in which it combined real economic dynamism with deep-seated political and social impediments to growth. He addresses France’s integration into a globalized early modern economy in a methodology diverse way, drawing on intellectual, economic, and social history. His first book, Revolutionary Commerce: Globalization in the French Monarchy (Harvard University Press, 2010), examined how French philosophes, merchants, and administrators understood the adaptability of the French monarchy to the modernizing forces of primitive globalization. Currently, he is working on a second book entitled, Cul de Sac: Patrimony, Capitalism, and Slavery in French Saint-Domingue (University of Chicago Press, 2017), a micro-history of one plantation in France’s richest colony. He has published in such journals as The William and Mary Quarterly, Past & Present, Dix-Huitième siècle, and Les Annales historiques de la révolution française. Cul de Sac: Patrimony, Capitalism, and Slavery in French Saint-Domingue. Chicago: University of Chicago Press, 2017. Revolutionary Commerce: Globalization and the French Monarchy. Cambridge, MA: Harvard University Press, 2010. "The French Revolution’s Global Turn and Capitalism’s Spatial Fixes." In "Forum: The French Revolution is Not Over." Special edition, Journal of Social History 52, no. 4 (Summer 2019). "Haiti's Commercial Treaties: Between Abolition and the Persistence of the Old Regime." In Balance of Power, Balance of Trade: the Politics of Commercial Treaties in the Eighteenth Century. Edited by Antonella Alimento and Koen Stapelbroek. London: Palgrave Macmillan, 2017. "Commerce." In The Cambridge Companion to the French Enlightenment. Edited by Daniel Brewer. Cambridge: Cambridge University Press, 2014. Aufklärung und die politische Ökonomie des Kolonialismus.” In Der moderne Staat und „le doux commerce”–Staat, Ökonomie und internationales System im politischen Denken der Aufklärung. Edited by Olaf Asbach. Baden-Baden: Nomos, 2014. With Alan Forrest, Lynn Hunt, Mathias Middel, and Karine Rance. "La révolution française à l'heure du Global Turn." Annales historiques de la Révolution française 374 (Dec. 2013). [link requires subscription access]. "L'Histoire du commerce." In Le Cercle de Vincent de Gournay: savoirs économiques et pratiques administratives en France au milieu du xviii siècle. Edited by Loïc Charles, Frédéric Lefebvre, and Christine Théré. Paris: INED, 2011. "Les économistes français et l'image de l'Amérique: l'essor du commerce transatlantique et l'effondrement du 'gouvernement féodal'." Dix-huitième siècle 33 (2001): 229–43. "Constitution and Economy in David Hume's Enlightenment." In David Hume's Political Economy. Edited by Margaret Schabas and Carl Wennerlind. London: Routledge, 2008. "Lumières écossaises." In Dictionnaire électronique Montesquieu. Edited by the École normale supérieure de Lyon, pour le compte de l’Institut d’histoire de la pensée classique. February 2008 (September 2013, 2nd ed.). “The French Revolution,” radio interview on WGN Chicago, Extension 720, March 22, 2011. 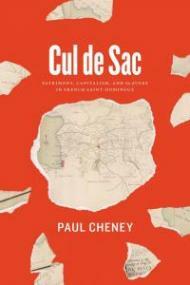 —Awarded the Society for French Historical Studies' 2018 Gilbert Chinard Prize for Cul de Sac. —Receives NEH grant to conduct a summer seminar for college and university teachers in July 2018. —Organizes conference on "Political Economy in the Age of Enlightenment and Revolution: Interdisciplinary Approaches"